Spread of education is the goal and mission of DumDum Motijheel Rabindra Mahavidyalaya. The college can boast of its peaceful academic atmosphere, its quality of teaching, and dedication of the teachers. The contribution of the College towards the making of a healthy society is worth mentioning, as the College does assure quality development, and need-based, as well as value based education. Rabindranath Tagore did not conceive of education as merely being a medium of earning. Rather he wanted education to build human beings into homo universals, who could attend to the call of the society, and the larger world, with a spirit of joy intermingled with the urge of creativity. Accordingly, our aim is to instill self-respect and a sense of good life among our students, along with their pursuit for academic brilliance, and to lead them to such development of their minds and thoughts. DumDum Motijheel Rabindra Mahavidyalaya and hope this website will provide you all the information regarding the courses matching your aspirations. Entering into the college is a remarkable episode in a student's life because this is the gateway of higher studies and improved learning. Keeping tis in mind we all in our College work round the clock to make our college more dynamic and vibrant place for learning. we have a highly skilled and professional team of staff, both teaching and non teaching, waiting for guiding you in building your career. Apart from sharing and transferring theoretical knowledge we also give importance on the extracurricular activities and personality development. Accordingly we have introduced some excellent facilities and we are working hard to improve the quality of those facilities year on year. All important information on the courses offered and other facilities are provided in this website. You can also find out more information about the excellent guidance and support services that available to you. 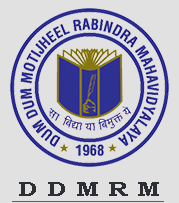 Dum Dum Motijheel Rabindra Mahavidyalaya DDMRM, Kolkata offers various graduate courses as well as Post Graduate courses. Dum Dum Motijheel Rabindra Mahavidyalaya DDMRM, Kolkata is affiliated to University of Calcutta, Kolkata. List of facilities available at Dum Dum Motijheel Rabindra Mahavidyalaya DDMRM, Kolkata for students. This page was last modified on 30 September 2016 at 20:09.